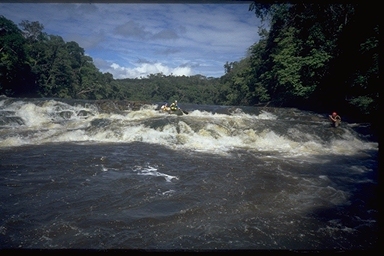 The first expedition to successfully canoe the upper part of the Merevari River, Venezuela. 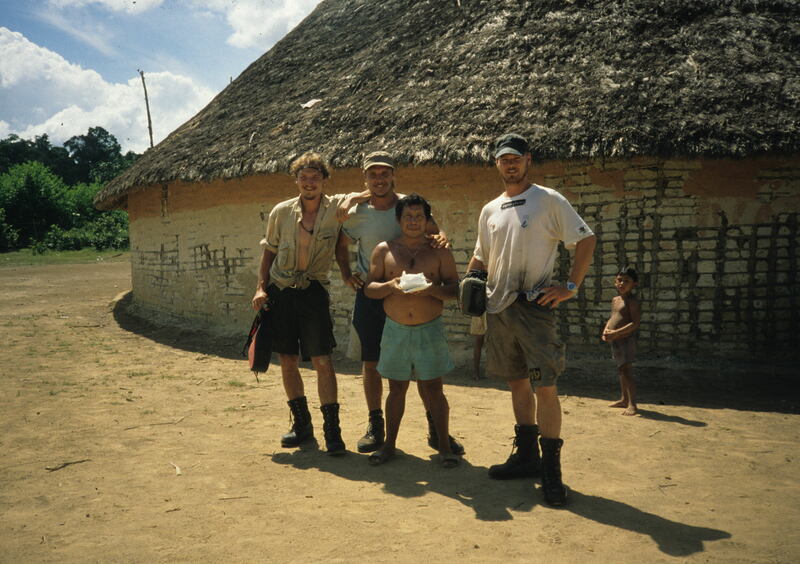 The 660 km long expedition from the source of Merevari to Entre Rios lasted more than 5 weeks, in some of the worlds most virgin and unexplored jungle. 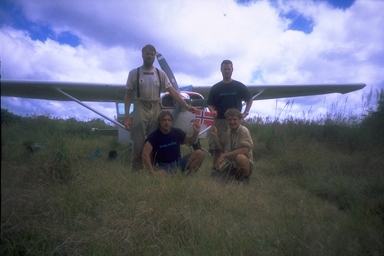 Team: Bjørn Loe, Per Arne Fossheim, Rune Gjeldnes, Gerd Altmann. Kind of a map of the route.Months of preparations have finally paid off. We are sitting in the aeroplane on our way to Venezuela. The destination is the heart of the Amazon rain forest. In this remote part of the jungle the Venezuelan Government has no authority. It is the land of the Indians. The laws here are made and managed by the Ye’kwanas- and Sanema-indians. One of the Indians, Mathias fortunately, speaks some Spanish and we immediately begin to pump him for information. 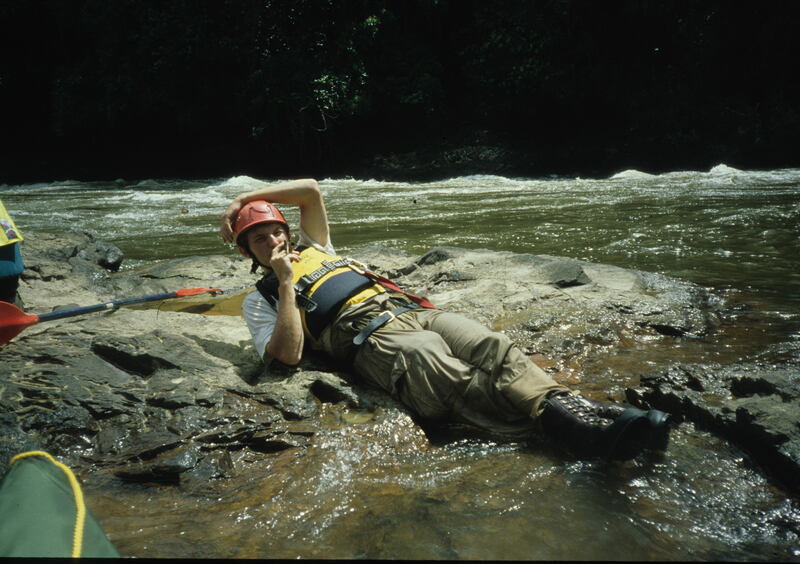 He speaks of an American expedition a couple of years ago with the same aim as us, to canoe the Merevari River. 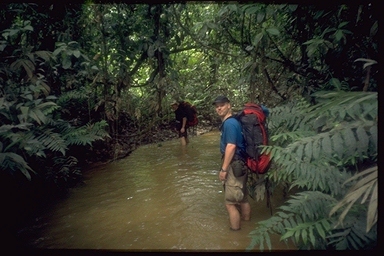 This expedition failed to even get trough the thick jungle leading to the river. Fortunate says that that was probably for the best, because the river is to dangerous to canoe. Not even the Indians has canoed the Merevari. We feel a bit uneasy, but are firm in the decision to give it a try. 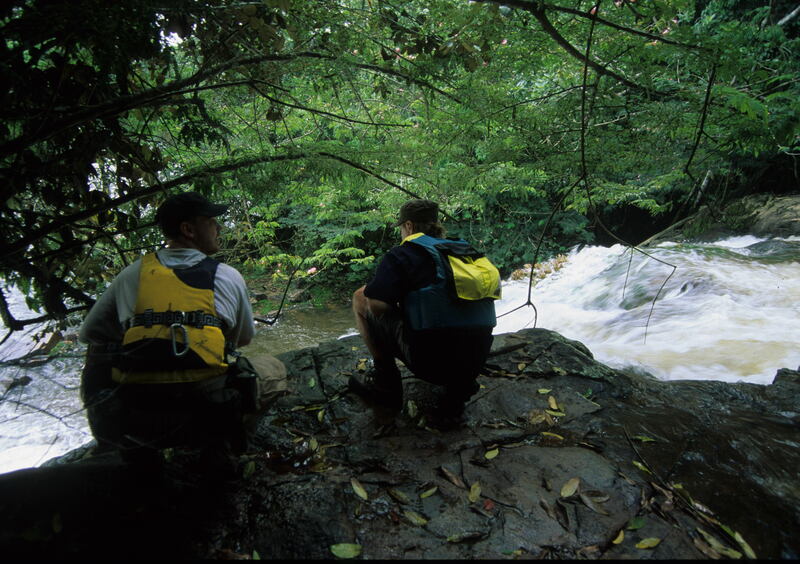 The first part of the expedition is to reach the source of the river. 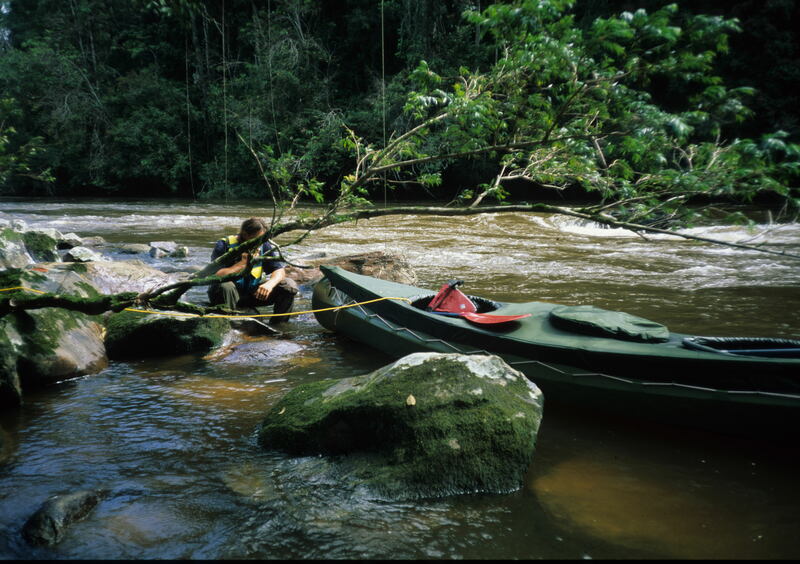 The source of the river is approximately 70km further south, trough thick jungle. We have to cut a path with our machetes to get to the river. As there are no roads all the equipment has to be carried. In total 320Kg. 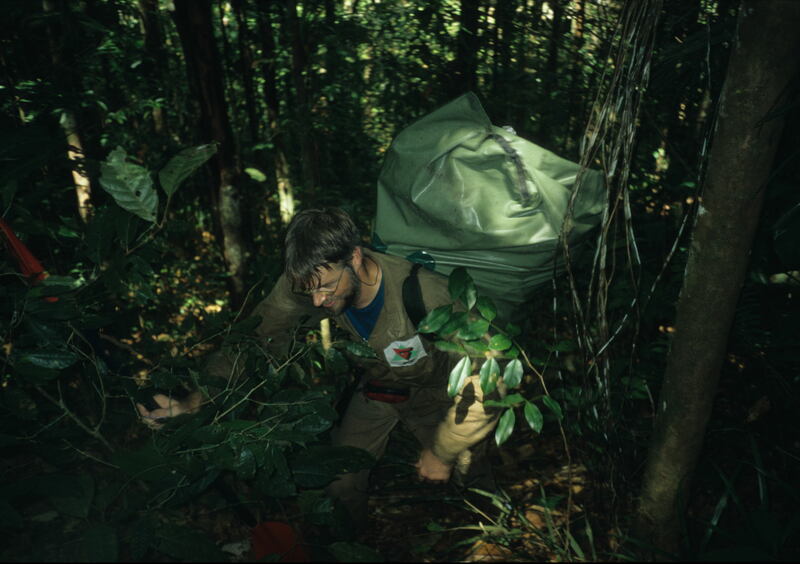 Per Arne with a heavy backpack uphill jungle. The jungle is even thicker than expected, and it takes hard work to cut our way trough. There are mosquitoes and bugs everywhere and the ground is alive under our feet. If you stop and rest for more than 10 seconds something starts crawling up you shoes and legs. The bees and ‘noseeums’ are extremely hostile. It seems as if something is biting you all the time. Suddenly one of the indians shouts a warning. A couple of feet from the path lies a 6 feet long, red snake in attack position. Even if it is not hunting, the snake is dangerous and can bite if it feels threatened. Careful steps takes us away from the danger, but we are reminded to keep our eyes open. Good and strong helpers. Wondering why we are there. Darkness falls quickly on, at 18 the sun goes down and ten minutes later there is total darkness. 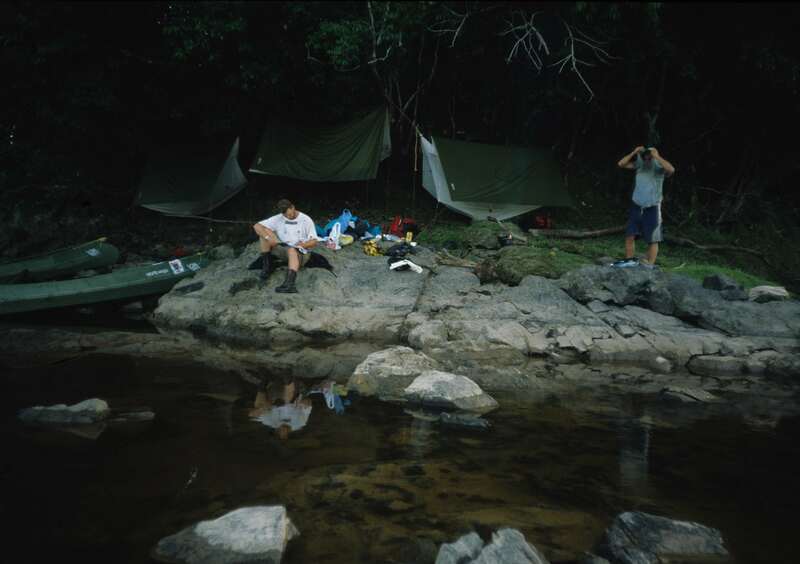 We set up camp, rigs up hammocks with mosquito net and fall asleep. 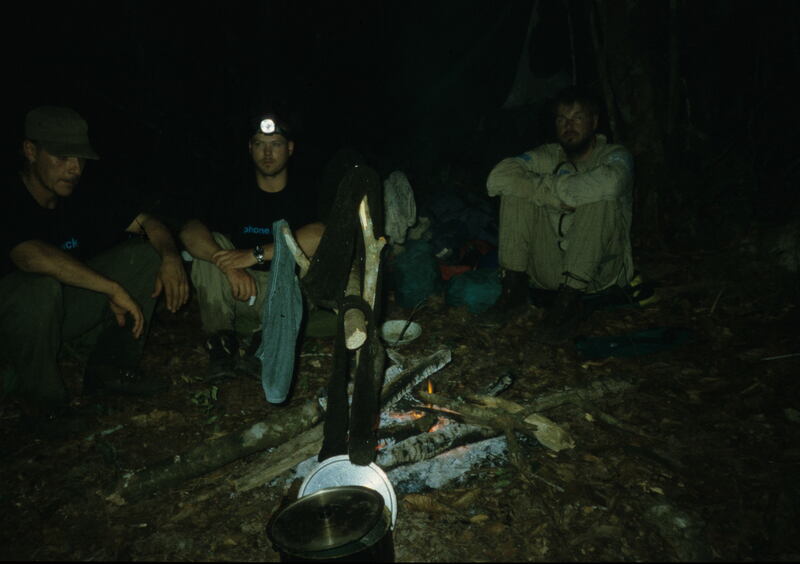 The first night we experienced why it was called the rainforest. The lightning blinded us even though his eyes were again, and the thunder peal kick and the wind got hammocks to swing more than we liked. The heavens open and vast quantities of water washes over us. All the equipment becomes wet, and wet it should also be for the rest of the trip. 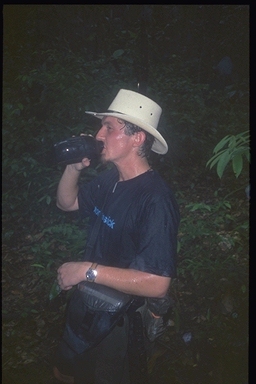 Clean water is life in hot and humid rainforest. 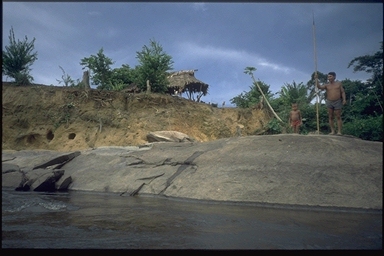 After 68 kilometers, four day marathon, with the Indians in the lead, Yerichaña, the origin Merevari River. We’ve all been on expeditions before, but the last few days are the toughest any of us have been through. 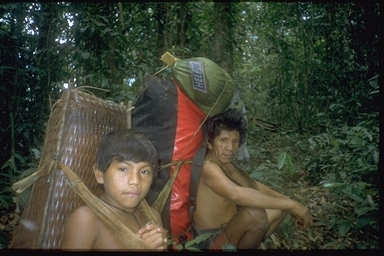 The Indians are a proud people and have probably done what they could to show us that even though they are small, they can carry more and go faster in the jungle than us. We thanked the Indians for help, seeing that they turn and disappear silently into the jungle again. After a night of little sleep we put together our canoes, and starts loading onboard equipment. The river starts out quietly with little water, but in the afternoon the river runs faster, and suddenly we hear the familiar sound of powerful rapids. We paddle up and see a long string of large stones that create flows into the dying trees hanging half above and half below the water. Overturns here are the possibilities of small to make do. We chop us into the jungle on the river bank and stop for the night. 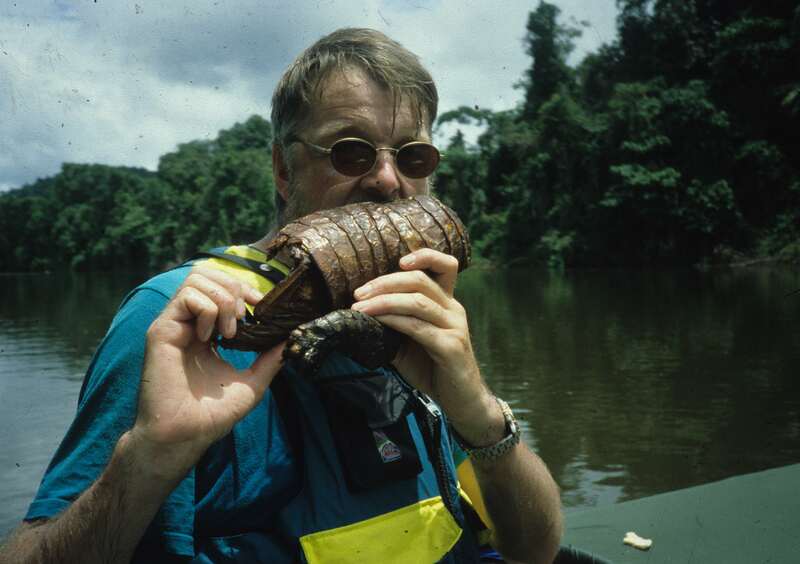 A 15 cm scorpion is split in two after the meeting machete to Rune, a large tarantula is costed on the river with a paddle. At night, all living in the jungle, we are left to hear the sounds. A large dark figure stroking mosquito net, I hold my breath, it is pitch dark, one hand clinging to the gun. EVENING FIRE IN THE RAINFOREST. The animal grunts, there is a boar, I breathed a sigh of relief, and finally grabbed me sleep. 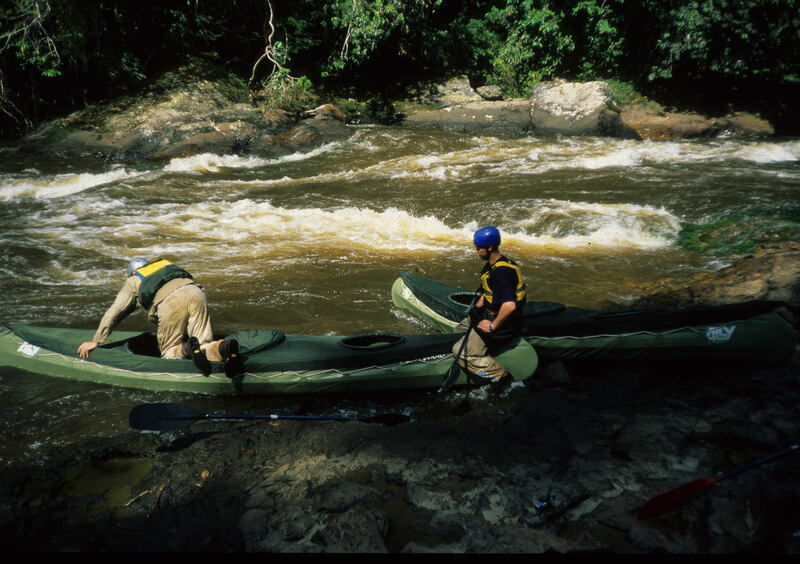 Our first rapid was impossible to paddle, we were starting what we later came to call “White Water Weeks.” Machetes were sharpened, and we hat to cut our way through the jungle, around the big rapids, and had to carry 320 kg equipment several turns. When evening came we had only managed to move one kilometer. The next few days were the same, time and distance had become our enemies, and they will catch us if we did not hurry up. We are far behind schedule. After days of continuous streak going, we realize what the Indians thought; that the river is not possible to paddle. We considered now the river as our most dangerous adversary and our best friend, it could crush us, or bring us out of the jungle. Raging waters forcing us riverbank. We have no choice, and go ashore to reconnoiter. After a few minutes I hear Rune shout MEDIC BAG, MEDIC BAG! I hear the voice that something is seriously wrong, tearing me medication bag and put off running down the river bank. Where do Bjorn is sitting on a stone, Rune on his knees in front of him. Snake bite in his hand! shouts Rune. I’m starting to tear up the medicine bag, while jumping the last few meters. I quickly finds two tablets prednisolone and gives the bear, he is cool and calm. Gerd is already underway to chop space for a hammock. We hang up the slack, so Bjørn could be sitting in the hammock, and get hold hands as far as possible. It’s been 15 minutes, the bear becomes paler, the arm begins to fade. This draws not good, infusion bag, epinephrine and morphine ampoules are made clear. Gert was about to rig up the radio, after a quick look at GPS’n and the map we found that it was no use. No helicopter had enough range to reach us. We were left to ourselves, now we had to get along with the medicine we had brought from Norway. Snakebite was one of the risks that we all know was there, and we had accepted, but hoped to avoid. Bjorn had slipped and taken out in a branch, where there was a snake. Pulse, pupils and feelings upward arm was constantly monitored. He will monitor shifts all night. Later in the morning we understand that Bjorn has fared. He is still somewhat powerless in the right arm, but determined to paddle on. The medication has obviously made ​​its impact, and we are very happy. We are now 185 kilometers behind schedule, rounding a bend, we are greeted by a roaring waterfall. “TO THE LAND” roars we to Rune and Gert. We are long out in the river, we paddle frantically toward the shore, the power is about to let go, suddenly throws a vortex front of the canoe into the mainstream again. We are heading sideways falls. The falls divide in half and in the middle there is an island. We are now in the middle of the mainstream, and our only chance to survive is to control the island. We need more speed than power, so that we have control. There are not many meters to the waterfall. We paddle for life. We need straight forward and not to any of the pages. Bjørn, who sits back and controls, turns the canoe slightly right towards the island he yells; PADLE !!!!! PADLE !!!!! PADLE !!!!!!!. The words seemed like a mix between an order and a prayer, we put the last powers, knows that power is about to let go, and crashes into the boulder field on the island. We get out of the canoe, ensuring the equipment and observes that the canoe had been a sharp gash in the bow, but we will definitely not paddle from here. GERT DEEP THOUGHTS ON THE RIVERBANK. Rune and Gert has managed to avoid the current, and is now built on the river bank and looks upset at us. The only way to get from island to try to get a rope from the lower side of the island, between the waterfalls, and over the river bank below the falls. Height difference is so great that here we should be able to get across without coming into power. We pack up climbing ropes, harnesses and restraint systems and provides evidence of Rune and Gert to go around the waterfall and get on the downside. While they use the day to cut through the jungle and get the gear down we prepare. Taking a safe shortcut down the waterfall. After several failed attempts, where water powered drag rope down the waterfall, we keep on giving up. But suddenly we see the fishing rod. We take the coil with late, attach a stone to the end and throws. It succeeds! Gert takes tendon, we attach the rope in the rope and get pulled over. Now it’s just hoisting equipment over and rappel over to the other side. 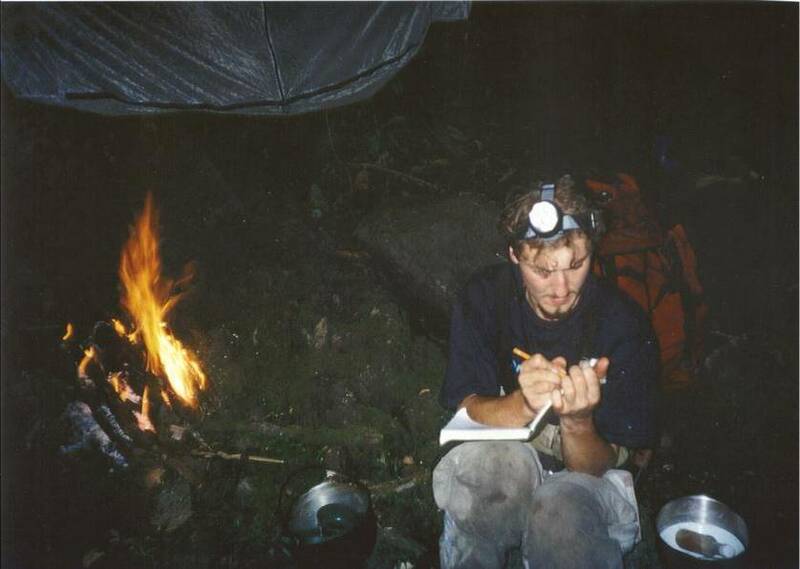 The hard work has begun to exhaust the energies, and so far we have just eaten 90 grams of cereal for breakfast, 90 grams for lunch and freeze-dried soup for supper. Now urinstinkt awakened in us, all the meat we obtain put in the soup, whether it’s crocodile, anteater, rats, birds or fish. We have begun to note that the body lacks sodium, magnesium, calcium, hydrogen carbonate, sulfate, and silicon. This is normal minerals found in water, but here are just “black” water without minerals. Bjørn and Gert studying the waterfall. JUNGLECAMP OR RIVERCAMP MEREVARI. ONE OF THE BEST ONCE. We see Native´s along the river bank, we paddle in, they seem reserved, but curious. We are apparently the first white people they have seen, for the tug us in the hair on the arms, legs and chest, and I think obviously this is very strange. They communicate in part by talking and partly with chirping and smack, and we understand nothing. The canoes and all the gear is also of great interest, one of the Indians press your finger against the soft cloth, then comes three slipped and a squeal. We have a lot of catching up to do, but the river has leveled out and we back add up to 70 miles a day, the sun burns mercilessly on the arms and legs, the heat makes us less attentive. After a turn, we begin what we believe is a small rapids. Only when we come down the rapids we see the end and hardens. The river becomes narrower, and the speed increases, large stones stock eddies and currents, the canoes being thrown from side to side. Rune and Gert lose control, and skew in the last roller. The canoe being dragged down, we see only white water, with a being the spitting again, the canoe is curled around the stone, Rune and Gert floating in the white water of the river. “Now it’s our turn, again!” I hear Bjørn cry paddle! Paddle! Paddle! We arrived right on the roller, front part of the canoe is covered by raging water, as the years went propellers, I felt that I whipped the air, suddenly I got more power strokes and we had done it, we were heading out of strengthened without overturn. Gert sits on a rock in the middle of the river. 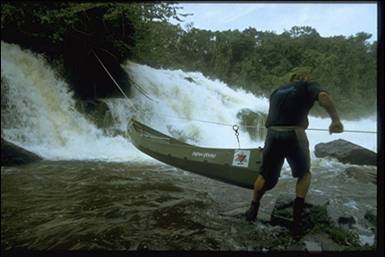 We can see the facial expressions that he has great pain, but the thumb comes up, everything ok.
Further down the river flowing parts of the canoe and the rest of the equipment. We gather as much as possible and get picked Gert in our canoe. The bruises all over the body reveals that he has taken a beating, but nothing broken thankfully. Gert is most concerned with the canoe, and with despair in his eyes he looks at the cracked and broken canoe. I try to reassure him by saying; “No problems Gert, we Norwegians are great shipsbuilders, you know,” he smiled. It was not the first time he had heard it on the trip. Aluminium tubes have been a number of violations, and there were large gashes in the fabric. The tubes deed we stick sticky twigs with the right “arc and angle” into the pipes, the cloth patched and we glued. The rest of the equipment was completed, it had a lot of beating, something was missing and some were destroyed, including the radio. We were now totally without communication with the outside world. Bjørn is trying his bamboo pipe. After a few hours of repair work can canoe again be on the water. Ten pounds heavier than ours, but totally doable. Once we had coped and overcame rivers immense power. In a clearing along the river bank, we see “dogout’er.” We extend arms in the air, “Yes”, we aim. Here in this small Indian town, we hope to stay for the next six days to the plane arrives, we have been looking forward to. The Indians will entertain us and are friendly, but joy turns out however to be short-lived. For, what was once a landing aircraft, has now become a banana plantation! 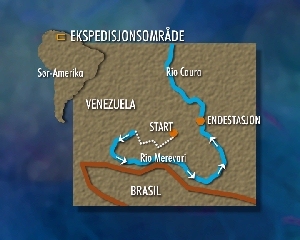 The map displays a meteorological station down by the river 240 km further north. We have to get there, to get it rerouted plane we have already paid for, and that will bring us. Later in the evening we will be with the Indians hunting. It’s not easy to get permission, but after many internal and intense discussions we finally get the go-ahead. Evening comes, darkness falls and the jungle comes alive. Tast good with crock meat. Gert dare not participate and exhorts us to be cautious. We must not under any circumstances give guns to Indians. A white man is not worth much here, especially not against firearms and other equipment as deadlines, says Gert. Rune is taking the notes of todays happenings. We are going on nightly crocodile hunting. This being our first trip around a “Dogout” and the excitement is palpable on. I have my gun in the shoulder holster so I can reach it with both hands. The canoe is heavy to paddle but moving silently in the water. After half an hour we suddenly hear a splash, head lights are directed towards the sound, and we caught sight of two red eyes. Bjørn loosen fuse and fires. He hit, but it is apparently not immediately lethal. The crocodile succumb and disappear. We wait with hope that the crocodile will float up, but no luck. Suddenly we become aware that we are about to sink. There are only a few centimeters that separates the river and the gunwale of the canoe, and we begin to tap into for life. The sounds invokes the Indians attention, they set light to the middle of the boat, understand that the canoe is about to go under and turns. The hunt is over. At dawn we start maratonpadlingen Entre Rios, where the weather station is located. Now we live in canoes, we paddle, having breakfast on board, paddle on while we devour lunch, and would rather not take a single unnecessary break. The river seems endless, and we have no time to lose. The last few days we were to relax on, has now become one of the hardest stages, and we realize that. Just plan on stretching the day as long as possible. The time is approaching 17.30 but we have found the campground. Suddenly we see two rocks jutting out of the water with a huge log across. 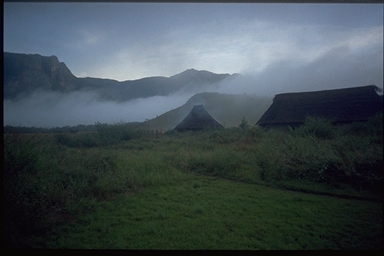 Here it seems that we can put up some hammocks, and we make fast an improvised camp on the island. We fought, river, clock, hunger and the feeling of never being dry. Ant, bee stings and spiders and other critters that fell down in the canoe from the trees along the riverbank we had become accustomed to. Each muscle fiber works, but we must approach the divine airstrip that will carry us out of the jungle. 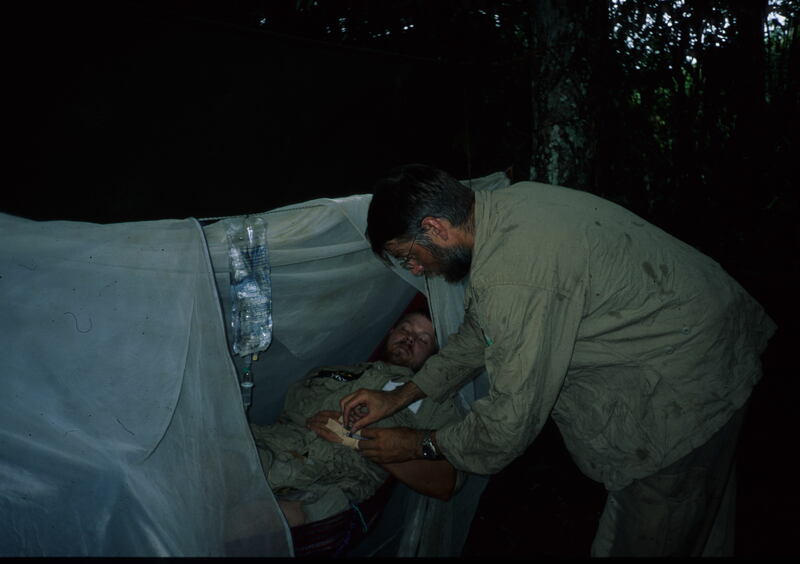 Beforehand, we have been warned by people with long experience in the jungle – never go out on trips longer than three weeks. Everything is green, you are constantly wet, either from rain or sweat. When you start to doubt if you ever get dry again, there is a danger signal. The idea has strike us … Suddenly we see a radio mast jutting up from the flat, green jungle carpet. We are in Entre Rios! Dogs alert our arrival, those who work on meteorological station comes out and takes good to us. We get food, get redirected the plane to come the next day instead, and put us hopeful to sleep. We wake up with anticipation, but are in doubt about our Spanish skills were good enough. I wonder if we really got explained that we want the plane to bring us today? Suddenly we hear noise from the air, and a small Cessna 182 takes a turn over the strip and the country. We loading in our things, and see that the plane is already half full. But the pilot waving us into the plane and continue to stack around us. Finally we sit with the luggage around, under and over us. Load weight of the airplane is 500 kg, but with luggage we must weigh at least 650 kg. The pilot runs to the end of the runway, and not turning the propeller plane before cutting the long grass where the path ends. So is it full throttle and somehow we leave the ground. 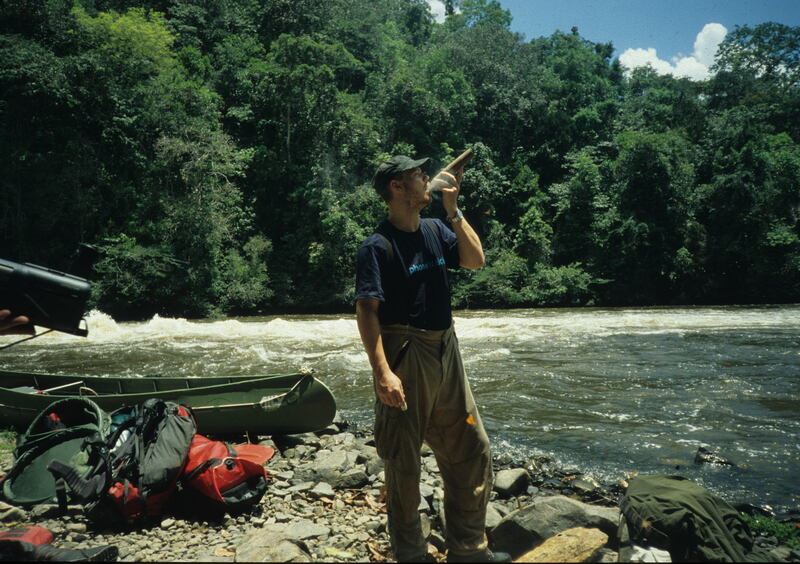 We look down on the jungle area and the river we paddled, and notes that the expedition has been successful. We paddled 660 km and survived all the dangers of the jungle.